Mr. Wilkins joined the firm in 2005 and became a partner in 2010. His practice focuses on land use and environmental law. Mr. Wilkins handles all phases of the land use entitlement and permitting processes, including administrative approvals and litigation. Mr. Wilkins’s practice covers the California Environmental Quality Act (CEQA), the State Planning and Zoning Law, the Subdivision Map Act, the Williamson Act, the California Endangered Species Act, the California Native Plant Protection Act, the Brown Act, the National Environmental Policy Act (NEPA), the federal Endangered Species Act, the federal Clean Water Act, waste management, water law, administrative law, as well as initiative and referendum law. 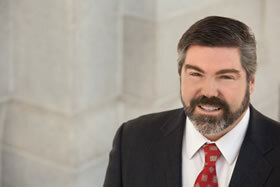 Prior to joining the firm, Mr. Wilkins was an associate attorney in the complex litigation and litigation groups at Kronick, Moskovitz, Tiedemann & Girard, where he represented public and private clients in state and federal court proceedings involving a broad range of matters, including inverse condemnation, eminent domain, contracts, products liability, unfair competition, and class actions. While working at Kronick, Mr. Wilkins volunteered for a month at the Yolo County District Attorney’s office, handling hearings, bench trials and a jury trial. Before entering law school, he served in various positions in the political arena, including research director for a state political party, political consultant and campaign manager. Mr. Wilkins regularly teaches land use and environmental continuing education classes and seminars for organizations such as the State Bar of California, Law Seminars International, and Association of Environmental Professionals. He also regularly speaks at conferences and meetings, such as the annual Environmental Law Conference at Yosemite. Outside counsel to Marina Coast Water District for review under CEQA of water and land use projects and in litigation defending a challenge to a proposed annexation. Mr. Wilkins also currently represents the District in challenges relating to well permits and a large desalination plant. Representing Homewood Village Resorts LLC, JMA Ventures LLC, Squaw Valley Resort LCC, Mountainside Partners LLC, and Kila Lodge LLC, in separate matters navigating CEQA, the Tahoe Regional Planning Compact, and land use entitlement processes to obtain permits from Placer County and the Tahoe Regional Planning Agency, as well as litigation in federal and California courts. Outside counsel defending Yuba County Water Agency in federal Endangered Species Act cases. The current case involves a challenge to several Biological Opinions regarding Central Valley spring-run Chinook salmon, Central Valley steelhead, and southern Distinct Population Segment of North American green sturgeon on the Yuba River. In prior cases, the plaintiffs alleged separate Section 9 “take” violations against the Agency. Represented Tahoe Regional Planning Agency in defense of challenge to its adoption of Regional Plan in the United States Court for the Eastern District of California and Ninth Circuit Court of Appeals. Represented Treasure Island Community Development, LLC and San Francisco Waterfront Partners II, LLC in separate matters navigating CEQA and land use entitlement processes to obtain permits from the City and County of San Francisco and the State Lands Commission, as well as litigation in California superior and appellate courts. Represented County of Contra Costa in defense of two challenges to its CUPA Hazardous Waste Generator program fees and refund claims. Successfully settled the matter after filing demurrer on behalf of County. The case settled on favorable terms for the County, and the fees remained valid. Represented large retailer in successfully navigating CEQA and local land use entitlement processes to obtain a conditional use permit for home improvement store. Despite vocal opposition during the permitting process, the project did not draw any litigation. The entitlements sought included a tentative parcel map, design review, demolition permit, grading permit, building permits, encroachment permit from Caltrans, Asbestos Dust Mitigation Plan, approval for a piped canal, National Pollutant Discharge Elimination System (NPDES) Permit, Clean Water Act Section 401 Water Quality Certification, and Nationwide 404 Permit. Represented California Department of Fish and Game (now Department of Fish and Wildlife) in defense of petition for a writ of mandate and declaratory relief claims relating to whether it was exempt from annual water-related assessments. The case was settled on favorable terms for the Department as it was not required to pay any past or future assessments and incurred no financial obligations to the plaintiffs. Represented clients in administrative hearings, including the California Energy Commission, Central Valley Regional Water Quality Control Board, and State Water Resources Control Board. Represented start-up companies in connection with proposals to site and obtain entitlements for proposed anaerobic digester facilities that transform organic waste into biogas fuel (hydrogen, methane), as well as biofuel, solar, and other clean energy projects. Assisting clients in consultations with stakeholders and advising on environmental review process. Assisted clients in successfully obtaining millions in grant funding. Friends of the River v. National Marine Fisheries Service (E.D. Cal., July 18, 2017, No. 216CV00818JAMEFB) 2017 WL 3034700 (Federal Endangered Species Act). 2013 WL 3070632 (E.D. Cal. June 17, 2013). Defend Our Waterfront v. California State Lands Commission (2015) 240 Cal.App.4th 570 (CEQA). Alliance for the Protection of the Auburn Community Environment v. County of Placer (2013) 215 Cal.App.4th 25 (CEQA). Sierra Club v. Tahoe Reg’l Planning Agency, 916 F.Supp.2d 1098 (E.D. Cal.2013) (Tahoe Regional Planning Compact, CEQA). Citizens for Open Government/ Lodi First v. City of Lodi (2012) 205 Cal.App.4th 296 (CEQA). 257 F.R.D. 607 (E.D. Cal. 2009).